When I learned I was about to receive the Paradigm Atoms for review, I spent some time reflecting on what was about to arrive at my doorstep. In the 20+ years Ive been into audio, this would be the least expensive pair of stereo speakers Ive ever had in the house save the PSB Alpha Mites that serve as surrounds in my home-theater system. What could I really expect from a small, $189 pair of speakers? Ive heard good things about them in the past but something at this price point, by definition, must use fairly inexpensive drivers, right? So how good could the Atoms really be? To put this into perspective, the first speakers I bought were almost $400, and that was over 20 years ago when I was still in high school. At the time, this represented the hard-earned income from something in the neighborhood of 50 lawn-mowings. The speakers turned out to have a good top end, aided by a better-than-average ribbon tweeter, and a decent low end from the 8" woofer; unfortunately these were accompanied by a mediocre midrange. It wasnt quite a speaker aimed strictly toward the boom-and-sizzle crowd, but it wasnt far off. To make matters worse, those ribbon tweeters had an ugly tendency to cook whenever you pushed them too hard. And here I am, 20 years older and used to having megabuck speakers around the house, about to take on a pair that cost less than half the price of the ones I bought in high school. Exactly what does your $189 buy? It wont buy real rosewood veneer, but that shouldnt come as any surprise. What you do get is a basic box speaker roughly the size of a sheet of notebook paper on the side and just a little narrower at the front. The review speakers are wrapped in a basic, but not unattractive, cherry vinyl. They look good. Cabinet construction seems pretty solid, with each speaker weighing in at a respectable 13 pounds. The back panel is a molded plastic affair with a port at the top and a single pair of five-way binding posts at the bottom. In between is a pair of pre-tapped holes for an optional mounting bracket. A black, non-removable grille hides a more interesting driver complement than I expected. The woofer is a 5.5" poly driver set in a die-cast chassis, and the tweeter is a .75" ceramic-metal composite. This is certainly a notch above the paper woofer in a stamped basket and poly-dome tweeters more typically found in this price range. Frequency response is rated at 70Hz-20kHz, with 89dB in-room sensitivity. I used the Atoms in a most system consisting of a Rotel RB-976 power amplifier, Sherwood NewCastle R-925 receiver (used as a preamplifier), and an Adcom GCD-600 CD changer. Of course, what really counts is how the Atoms sound, and this is where the big surprises started. The Atoms presented such a full, lush sound and threw such an enormous soundstage that, while I was breaking them in, I walked into the room and wondered aloud if all that sound was really coming from those two little speakers. It was. This was especially evident on Cousteaus Mesmer [Palm CD 2058-2]. Cousteau's rich sound consists mostly of mixed acoustical instruments, including piano, violin, harmonica and, believe it or not, flügelhorn. It is not your average band, and these are not your average low-priced speakers. There was more than enough detail to let each instrument add its own distinct voice to the harmony without sounding overly analytical. That harmony was aided by excellent tonal balance and integration between the drivers, but it was the soundstage and dynamics that really caught my attention. Next I tried out Bob Mintzers Only In New York [DMP CD-501]. On "TV Blues," the clapping at the opening of the track was evident as individual claps, something I wouldnt normally expect at this price range, but the detail and imaging possessed by the Atom get the job done. The Atom produced enough bottom end to make the bass on this track believable, if a little lacking in impact. At moderate to high volume levels, the top end was open and extended, with air around the cymbals and horns. At lower volume, the midrange seemed a bit recessed but was still clear and articulate. At all times and all volumes, Bob Mintzers voice came through clearly with natural tonality. What about the "pop" test? For this I threw in Cherry Poppin Daddies' "Mister White Keys" from Zoot Suit Riot [Mojo UD-53801]. The finger snaps at the onset of the track jumped out with the clear and pronounced snap I knew so well. The drums at the opening of "Mr. Bones" had slam -- not as much as on my reference speakers, but it was definitely there. The horns were clear without being raspy or annoying, and vocals, once again, remained natural. I could see a pattern beginning to form. So, weve been through a little rock and some jazz, but what about classical music? I decided to give the Abbado/Berlin P.O. Dvoraks Symphony No. 8 [Sony SK 64 303] a spin and see if the Atoms were up to the task. In a word, yes! Here again, the wide soundstage and impressive dynamics came into play, building an entire orchestra more than credibly -- and this from a pair of speakers that can be overlooked quite easily by the average audiophile magazine that likes to fixate on products many times this one's price. The strings were nicely showcased during the quiet segments of the second movement. The solo violin sounded completely natural, with just the right touch of warmth and good image placement. That the Atoms do so well with large-scale orchestral works is a remarkable achievement. Which brings me to another point. The Atoms seemed to have an unusual ability to soak up power and play loud without strain for such a small and inexpensive speaker. I regularly pumped everything I had at them. Occasionally, the treble would get a little hard, but it was never irritating. The sound was huge -- more in line with a much larger speaker, other than the lack of deep bass. During the entire time I had the Atoms in my system, I never got over the surprise of putting a CD in and hearing these little speakers belt out incredible dynamics and such an enormous soundstage. I quickly learned I could push them hard without breaking anything. Ill take the Paradigm CMC tweeter over those fragile ribbons I had in high school any day! To sum up: What does your $189 dollars buy you in the Paradigm Atom? Paradigm wisely chose to spend money where it counts the most: on the drivers and crossover. What that gives you is an extremely well-balanced, natural-sounding speaker on just about any music you might wish to throw at it, though it seemed particularly happy with jazz and classical. The Atom resides ever so slightly to the warm side of neutral and has enough bass that it doesnt require a subwoofer to be enjoyable -- although it mates extremely well with one to produce full-range sound. Of course, theres also the wide soundstage, excellent imaging and, lest we forget, much better-than-average dynamics, with an unexpected ability to play loud. On top of all this, I never once found the Atoms to be fatiguing, which may be their most important feature of all. Of course, there's a lot you don't get with the Atoms. You dont get a fancy wood-veneer finish or heavy-duty all-metal binding posts. You dont get a removable grille. Theres also not much of anything in the way of low bass. Bass requires moving lots of air and thats something a small driver cant do without a lot of cone excursion and loads of power. But, unlike many other companies, Paradigm didnt boost the midbass to try to fill out the bottom end. This wouldve just screwed up the all-important midrange. And, at the other end of the sonic spectrum, the Atoms never sounded bright. Again, I think this was an intelligent design choice. 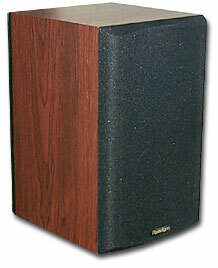 Too many inexpensive speakers are made overly bright to give the impression of an extended top end. I suspect this is one of the primary reasons the Atoms sounded so good when pushed hard. Theres something infectious about the sound of the Atoms. Oddly, despite their price, theyre probably not the most accurate speaker Ive had in the house in recent months, but theyre easily among the most enjoyable. During the course of this review, my own $4000 Silverline Sonatinas sat in a corner gathering dust, but what came as a big surprise is that I didnt really miss them. Not that the Atoms were necessarily better in every way, but they did act as proof that you dont have to spend a small fortune to get really good sound. Heres a pair of speakers that costs about the same as ten fill-ups of my mid-size car and theyre just a heck of a lot of fun to listen to. I think thats pretty amazing. Several decades ago I saved up money from mowing lawns all summer to buy what would be a pretty awful pair of speakers in comparison to the Atoms. I wish the Atoms had been around when I was in high school.